In the previous article I gave a broad lesson on taking better pictures which can be summarized: be conscious of what you are seeing, think how the camera will see it, and take the picture in soft light. In this article, I will focus on two themes: how to take better pictures and how to design gardens that photograph better. So let me give some design advice this time, but let me be clear: I do this selfishly. My tips are purely aesthetic, to make a photographer’s job easier. These are design ideas that make the garden photogenic, not ones that will make healthier plants. I am assuming, presuming and praying to Flora you will put the health of the plants ahead of all aesthetics. Native plant gardens tend to be hard to photograph. Often the gardeners care more about the plants and habitat than the aesthetics. This is perfectly okay – unless you are trying to photograph them. When I try to find a photo in a garden, I first look for leading lines. These are lines, hardscape or plantscape, that can lead the viewer’s eye into the photo. The lines can frame a composition and lead to focal points as well, but fundamentally they will start at the bottom, out of the composition, and lead into the garden. If at all possible, add some curves in the path. Not only can this make a small garden look bigger, it encourages a slower walk. They can be anything that creates edges: fences, walls, streams, rows of plants, hedges, and especially pathways. Most gardens have paths, and by definition they lead into gardens. They lead the photographer’s eye as well. If the path is well defined, weed free, and especially if it is paved hardscape, it becomes a composition tool. If at all possible, add some curves in the path. 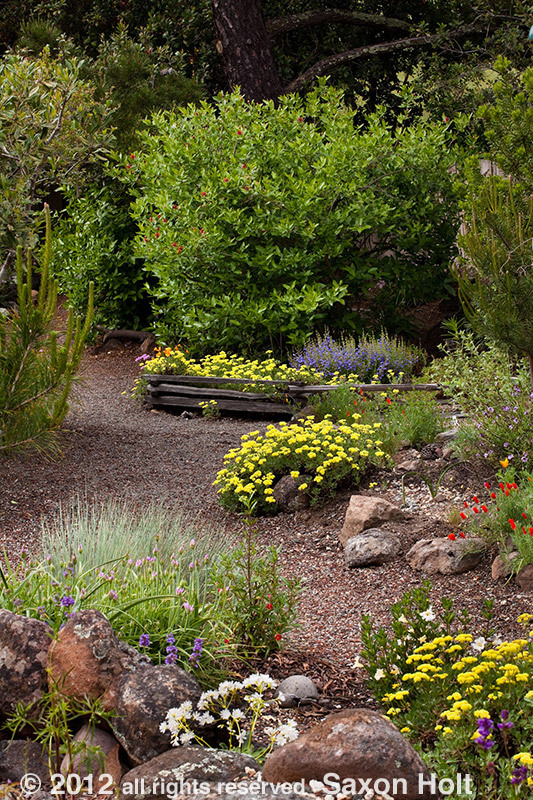 Not only can this make a small garden look bigger, it encourages a slower walk, and allows for transitions and more diverse planting clusters as in this Kat Weiss designed garden. Including some taller shrubs in the curves, such as the Ceanothus behind the bench, will not only give a design hint of another garden room beyond, it gives the photographer a framing tool. Even simple paths can become strong photo elements when they are accented. That can be done with a distinct material like fresh mulch or gravel, or it can be edged with fieldstone or brick. Anything that will help give definition to a leading line: think how eye-liner works. 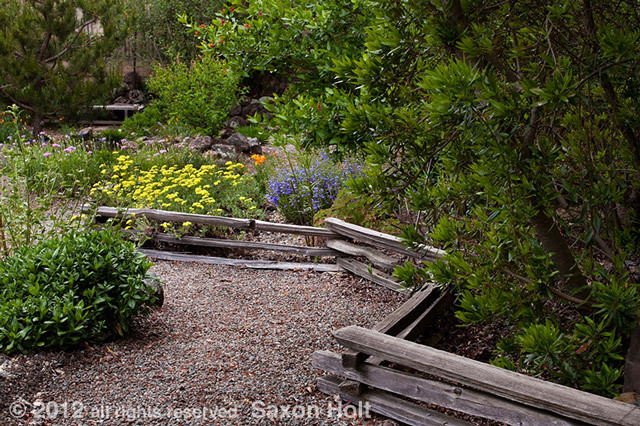 In Al Kyte’s Moraga garden he added this low split rail fence, which helps make a good garden into a good garden photograph. By helping to define this edge between path and garden he gives us a leading line into the garden. I love the way he placed the rails to add some interesting angles to what is really a straight path. 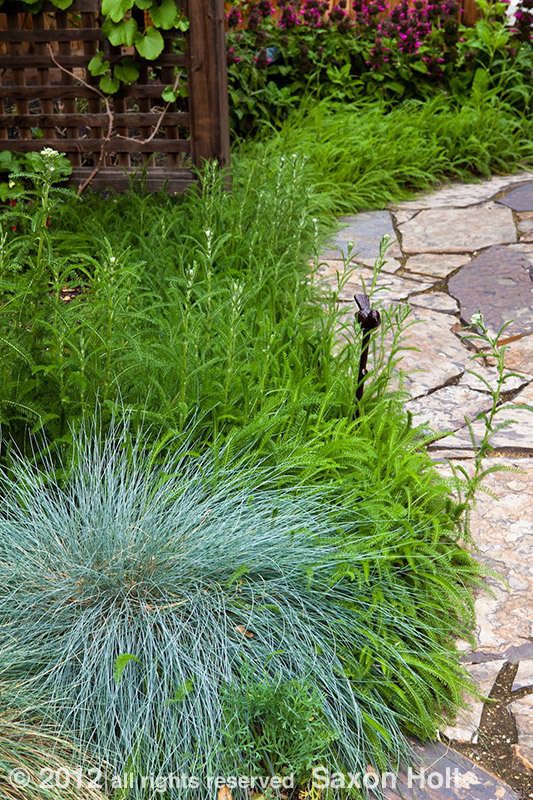 Besides hardscape, some thoughtful planting schemes can also help accent pathways. Repetitive planting schemes and carefully placed accent plants can draw the eye down a line. Note how a succession of sulfur buckwheat (Eriogonum umbellatum) can create a line and draws us into the picture. I could imagine that grasses or silver foliage Salvias and Artemisias could do the same thing. Also note how the rocks help define this edge. The plants of California offer us many, many interesting design opportunities. Many are photogenic in their own right. However, in a garden setting, to attract the camera, we need to use some design skills that will show off their strengths and position them to be noticed. Next time I will switch back to photography tips that will help frame a composition that will take advantage of good garden design. Notice how all the leading lines in these photos start at the bottom, off center, and lead across the photos? Stay tuned. Saxon Holt is a member of the CNPS Marin Chapter. 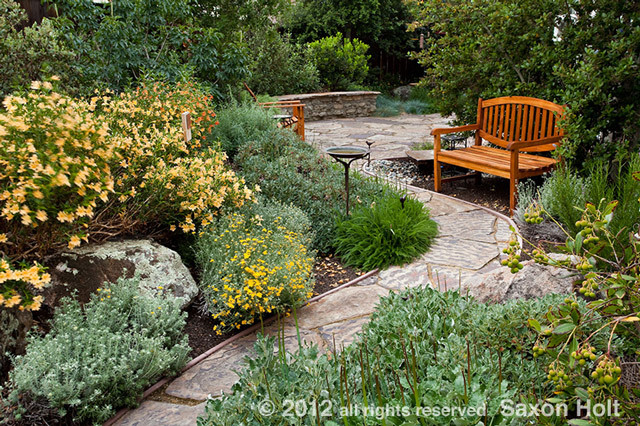 His work as a professional garden photographer is well known in EBMUD Plants and Landscapes for Summer-Dry Climates. His most recent book is The American Meadow Garden. In addition to his workshops as Photography Program Director at San Francisco Botanical Garden. Thanks for all the composition tips! I look forward to more. I’m obsessed with CA native grasses and they are a challenge for me to photograph. I have more luck with video because of their natural movement. However Calflora isn’t accepting video yet ;-). Yes, love the paths in your photographed gardens, and in my own. My small back garden has several sitting spots located for advantageous viewing of birds, bugs, lizards. And the paths serve my small dogs in their patrolling detail as they ensure we are free of intruders – and for sunbathing. For me, the curved path lets me know there is something unseen and unknown, just ahead, even in the small garden.